Happy new year! I've decided to kick off 2015 with a sweet treat. The holidays are over but we certainly don't have to live without chocolate! This rich and satisfying smoothie feels indulgent but offers a lot of nutrition: protein, iron, fiber, omega-3s. and calcium. It provides a good balance of carbs and protein—a combo that helps you feel satiated for a long time. Sounds like a great way to start your day, huh? 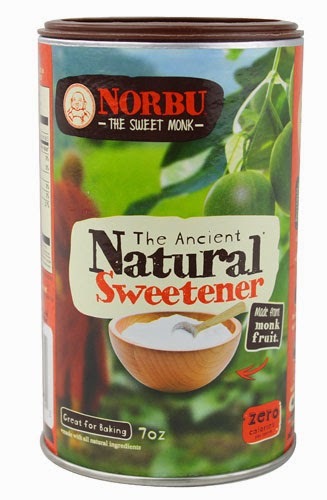 I incorporated an ingredient that's new to me: Norbu, a natural sweetener made from monk fruit. The company sent me some free samples to experiment with and I decided this smoothie would be a great place to start, since you definitely need to add some sweetness to balance the bitterness of the cocoa. Norbu is naturally sweet, has zero calories, and is low on the glycemic index; however, it does have some carbs, if you're tracking your intake. I was pleased to find that Norbu worked well in my recipe—it didn't add any weird taste or aftertaste, and sweetened the smoothie nicely! Put the oats in your blender and process until they turn into a fine powder. Then, add the rest of the ingredients and blend until smooth and frothy. If you want, garnish with some oats and chocolate chips. Tastes like a delicious cookie, but nutritious enough for breakfast! Love this, and I must try Norbu soon! Hey i really want to make this - where can i get norbu if i want to try it? you can buy it on amazon (either follow the links in this post or just search for it on the site). Yum! I used 1/2 a banana instead of the sweetener. It was delicious and kept me full throughout the morning! Delicious! Totally satisfies the chocolate peanut butter craving. I used light vanilla almond milk which turned out gritty, but added 1/2 banana as the sweetener and it smoothed it out.